Episode 194: What's going on? Samaje Perine proved his worth at the University of Oklahoma. In 2014 he had a stellar year. In 2015 and 2016 the stat line would suggest a decline in his performance, but that is due in part to sharing snaps with Joe Mixon. Perine set the single game rushing record for all of the NCAA by tallying 427 yards. He averaged 6 yards per carry over the course of his 3 years in a Sooners jersey. Rob Kelley is Samaje’s only competition for snaps since Chris Thompson will get most of the receiving snaps from the backfield. Kelley only averaged 4.2 yards per carry last season. After losing Pierre Garcon and Desean Jackson, the Redskins are going to need all the yards they can get on each play. This makes Perine the more desirable back. One of the qualities that Perine possesses that I admire is his ability to gain ground when he is tackled. TV announcers often say, "he did a nice job of falling forward to get the first down". I would not say that Kelley is bad at this, but Perine is great at it. Another thing I like is that unlike most big running backs, Samaje is able to make people miss tackles in the open field. Even if Rob Kelley were to get more snaps than Perine, the offense will still be in the red zone frequently. Perine should see the majority of the carries at the goal line. I would compare Perine and Kelly to Blount and Lewis from the Patriots last season. Assuming that both backs split carries evenly with Perine getting the majority of goal line snaps, he can have a 1000 yard season with 12 touchdowns. If he gets the starting role then he could see more yards. I would not reach too far for him, but if he is available later in 6th or 7th round then he holds a great value. I think that he can have a season much like Ezekiel Elliott had last season. The main difference that I notice is that Zeke had very little competition. Even if he is not the primary back he can still be useful in dynasty leagues or as a flex option in other leagues. Don't get me wrong, he is a long way away from being Zeke, but if he can start off the year hot he will carry that through the season. When it comes to fantasy football, you can do all the research you want. You can track team offenses, pass-to-run ratios, and amount of plays each time runs. You can assess the talent along the offensive line, at quarterback, running back, wide receiver and tight end. After you've done as much due diligence as possible, you can start to develop your fantasy football beliefs. Everybody has the players they liek and don't like for whatever reason, and you're no different. Chip Kelly served as a primary example of that this past offseason, when he routed star running back LeSean McCoy to Buffalo in exchange for a young linebacker coming off a knee surgery in Kiko Alonso. He even picked up the much maligned Tim Tebow and slotted him into the No. 3 QB spot. Lord only knows what Chip has in store. But what Kelly showed all of us is that you have to go with the players you feel most comfortable with, both in your system and character-wise. If you don't like the Dallas Cowboys for whatever reason, you can still draft a highly successful fantasy football team while avoiding their players. After all, it's no fun rooting for a player to succeed on a team that you hate. That's why we've decided to talk about a player we strongly believe as we enter the crucial last week in August and most leagues are starting to draft. We believe in this guy like Bill O'Brien believes in the F bomb as an effective motivational tool. A certain quarterback we feel is worth drafting in the first round. Yes, we actually want you to abandon the stigma that you can grab quarterbacks in the later rounds of the draft for this one guy. His name — Andrew Luck. Why do we want him on our team so bad? Two words — Peyton Manning. Yes, we've compared Luck's potential in 2015 to that of the Denver Broncos quarterback just two seasons ago. If you remember correctly, Manning lit the fantasy football world on fire week-in and week-out in 2013. He scored over 25 points (standard scoring rules) nine times, that's more than half a season you had your quarterback score you 1/4th of 100 points on his own. It was a huge leg up for any owner. Luck really started out hot in 2014. In the first month of the season, he went on a three-game tear where he threw for at least three touchdown passes and less than 1 interception per game. In two out of three of those games, he tossed four touchdowns. That's about as good as it gets if you're playing in redraft leagues and need a consistent quarterback. Playing an important role in your team's success is also key if you expect a player to consistently produce, and Luck is to his team what Manning was to the Colts — they need him to play well to be successful. Unlike New England, a team that changes up its strategy from game to game, the Colts engaged in countless shootouts with other great quarterbacks en route to their first AFC Championship appearance since 2010. Luck finished with 616 passing attempts, trailing only Matt Ryan and Drew Brees. Plus, with the latest injury to Green Bay Packers star wideout Jordy Nelson, the gap between Andrew Luck and Aaron Rodgers has widened a bit. Not saying Rodgers still won't be an elite fantasy quarterback, but don't be surprised if the Packers lean on the run more to close out games in the absence of a big-play threat like Nelson. The Packers still have a formidable rushing attack with Eddie Lacy and don't need to rely on the pass as much to win games like the Colts will need to with Luck. Now, Luck might not toss a record-breaking 55 touchdowns like Manning did, but he's arguably the most talented quarterback in the league. He's in his prime and plays in a souped-up offense with a good mix of young talent (T.Y. Hilton, Donte Moncrief, Dwayne Allen, Philip Dorsett) and veterans (Andre Johnson and Frank Gore). Luck is also a very durable and hasn't suffered any serious injuries despite playing with a below average offensive line. Rodgers, while relatively durable in his own right, has a history of concussions, suffered a clavicle injury which caused him to miss seven games in 2013 and was hobbled by a leg injury last season that affected him going into the postseason. Overall, Luck is one of the safest picks in the draft and normally we wouldn't advise to go with a quarterback in Round 1, but he's as close to a guarantee to be the Top 3 in his position as any player in the league this season, which is more than exciting in the sometimes cruel world of fantasy football. The running back position requires an athlete to possess several traits for success. One of the crucial ones is competitive drive. The ability to initiate contact with defenders typically much bigger in size, keep your feet churning to break tackles and extend plays is key to turning a five yard gain into eight yards. This trait is even more crucial in short yardage situations where your team needs a few inches on the goal line for a touchdown or first down. One of the most promising prospects in this area is Ohio State junior Ezekiel Elliott, a running back that also possesses the athleticism and durability needed to excel at the pro level. Elliott was unveiled as the Buckeyes feature back for the first time in 2014, replacing current 49er Carlos Hyde. He flourished in coach Urban Meyer's revamped offense, a scheme that was a departure from his spread days in Florida. The attack focused more on inside zone blocking plays and power runs up the middle. While many hear 'zone blocking' and immediately equate it with running backs avoiding contact and seeking consistent three-to-four yard gains, that wasn't the case with Elliot. He was a physical runner that used his strength after contact to wear down defenses and eventually break big gains in the later stages of the game. The offense involved a lot of cutting off the center up the middle, and Elliot proved very good at this up-the-gut style of running. The sophomore ended up rushing for 1,878 yards, a number that trailed only Melvin Gordon and Tevin Coleman. Elliot finished the season with 20 rushing touchdowns and also added 28 catches for 220 yards (7.9 yards per catch average). He was Top 5 in several rushing categories for the Big Ten, including rushing attempts, rushing yards, touchdowns, and plays from scrimmage. When looking at Elliott, he's got several characteristics that make him a potentially good runner at the pro level. At 6'1, Elliott is a little taller than your average running back and has a thick frame at 225 lbs, giving him an NFL-like weight despite being only a junior in college. He shows good quickness when diagnosing a play both physically and mentally, and has the agility to cut off center and between the tackles. His balance is very good and allows him to continue running downhill after contact. A hard-nose runner, Elliot saw his most successful runs come in between the tackle and tight end on inside zone plays with the Buckeyes. He shows good burst getting to the line of scrimmage with good lateral quickness to cut off inside blocks. He's patient when waiting for his blocks to set up and cuts up field decisively and without losing speed. He has the vision to run off blocks at the second level and stands a good chance to break off a big run if he sheds a tackle or two. He also has the speed to beat defenders to the edge and get up field. His transition from a 45 degree angle to north-and-south is fluid, and he maintains a good forward lean when running which keeps him from running too tall. He also keeps his feet churning after contact which allows him to pop defenders backward upon contact and gain extra yards in combination with his strength at 225lbs. He struggles when trying to run for long touchdowns as his lack of top-end speed often results in him getting tackled from behind by corners and safeties. Elliott has only managed to string together a stellar season just once, an obvious thing to write but still important considering teams will be gunning for him more in 2015. Though he'll have a sign on his back, he's already battle-tested when it comes to playing against the best teams in college. He posted four touchdowns and 246 yards rushing against Oregon in the National Championship game. He also ran for 230 yards and two touchdowns against Alabama, a team ranked fourth in points allowed (16.6) in 2014. It's important when any athlete plays his best against the toughest of defenses, and Elliot demonstrated he could do that. He could also wear defenses down throughout a game, as his biggest runs typically came in the second half when Ohio State needed a breakthrough play to seal a victory. Elliott accomplished all this despite playing with three different quarterbacks and capped his year off with a 246 yard performance in the National Championship game against Oregon to go along with a season-high four touchdowns. He proved he could remain durable with 273 attempts and no injuries. Elliott's biggest weakness is his pass blocking. He typically stands too high when engaging defenders which allows him to get driven back by pass rushers. He lacks the desire to pass block and will throw his shoulder in at times instead of squaring up the defender. He does, however, display a desire to run block and relished the opportunity to hit linebackers in the middle of the field on quarterback keepers. That will be something to take notice of if he hopes to elevate his status to potential first-round draft pick either in 2016 or 2017. Elliott can definitely make tough catches. He posted a seven catch game against Indiana and three games with at least four receptions. He's not expected to catch the ball a ton in the Buckeyes' offense, but it's a skill he's proven to have. Overall, Elliott is a very good power runner that can move piles with his strength after contact. He has the potential to be a 1,000-yard rusher in an offense that values running the ball up the middle and with the inside zone. A team that runs the inside zone quite a bit is the Philadelphia Eagles. This offense would be ideal for a player like Elliot. He still needs to develop his pass blocking, but he has a good chance of going in the first round based on his running talent alone. Link to join Draftkings $10M Fantasy Football Tournament for Week 1. $25 buy in but it's the largest payout they've ever given. Entering the 2014 fantasy draft, Montee Ball was being scooped up early by fantasy owners who thought they had found the next big thing. Those that expected RB1 numbers from Ball were sadly mistaken, as a season of injuries and the emergence of CJ Anderson caused him to finish as the 90th RB overall in standard scoring behind teammates CJ Anderson (11th overall) and Ronnie Hillman (41 overall). To put how disappointing Ball's season was into perspective, Ball finished with only 27.4 fantasy points on the season in 5 games played. These beyond disappointing numbers in 2014 killed many owners fantasy seasons, but now the hopefuls are looking to the future... and the future's name is CJ Anderson. Entering 2015, Anderson is going in current mocks between the late first to second round, eerily similar to Ball's ADP entering 2014. Could this spell disaster for Anderson next season? This analyst thinks that the clear answer is a resounding 'no.' Let's take a look at both backs in order to find proof that Anderson is not doomed to repeat the failures of Montee Ball. In 2013, Knowshon Moreno finished as the #5 fantasy running back with Ball (next big thing) showing flashes of greatness. When Moreno left the Broncos after the 2013 season, the fantasy world was abuzz that Ball would be the workhorse back and repeat Moreno's numbers in 2014. This was pure speculation. In his entire rookie season, Ball never had more than 15 carries per game and averaged only 7.5. In other words, Ball was never the bell cow in the Broncos' 2013 offense so to expect him to just take that role in 2014 was nothing but a hopeful prediction. Additionally, Ball only had a single 100+ yard game (13 carries for 117 yards) and in that game had a single rush for 45 yards. Remove that rush and Ball had 12 carries for 72 yards, which while still impressive is not RB1 material. Finally, even though Ball showed some flashes of being a viable fantasy starter in 2015, there was one glaring statistic that should have made people realize he couldn't be the workhorse back in 2014. In his rookie season, on rushing attempts 11-20 Ball averaged only 3.4 yards per carry. In other words, when Ball was given more than 10 carries per game, his stats dropped significantly. After taking a look at the numbers, it seems that there's a bit more evidence supporting Anderson's case. In the first nine weeks of 2014 Anderson tallied only 17 carries. In week 10, he began to take the reins and rushed for 90 yards on 13 carries (6.9 yards per carry). Fully taking over the backfield in week 12, he averaged 23 carries per game (140 carries in 6 weeks) and 4.6 yards per carry (648 yards on 140 carries) for the remainder of the season. This is the definition of a workhorse back, a role that Montee Ball never actually achieved in 2013. And remember that glaring statistic of Montee Ball only averaging 3.4 yards per carry after 10 rushes? It doesn't seem like Anderson has that problem. On carries 11-20, Anderson averages 4.3 yards per carry, and on carries 21-30, he averages 4.9 yards per carry. These are the type of numbers required from a workhorse back and should continue in 2015. Now I know these numbers are extremely close (too close to call really) but with how similar they are it makes you wonder why Ball was drafted in the second round while Anderson went undrafted. After crunching the numbers, it is clear that CJ Anderson has solidified himself as a workhorse-capable back. He is entering the 2015 season as the Broncos #1 back and with an expected reduced workload from Peyton Manning, Anderson looks like one of the best backs (situationally) for 2015. Additionally, with Gary Kubiak returning to the Broncos (this time as their head coach) I expect even more emphasis on the running game. In my opinion, if Kubiak (as offensive coordinator) was able to turn the journeyman, Justin Forsett into a viable fantasy starter, I can only imagine what he can do with a gem like CJ Anderson. Because Ball's ADP in 2014 was based on speculation and assumed potential, he failed to live up to the hype. In Anderson's case the hype is real! I expect Anderson to finish in the top 10 for RBs easily and could push the top 5. Look to scoop up Anderson in the back end of the first round or the very early second round. Is Andre Ellington worth the investment in 2015? In 2014 fantasy owners in every league invested heavily in Andre Ellington with the hopes that he would have a breakout sophomore year. Unfortunately, Ellington experienced what can only be considered a sophomore slump. His previous 5.5 yard per carry average plummeted in 2014 to 3.3, and he was only able to rack up 8 more rushing yards in 2014 (650) than in his freshman season (642), on 83 more carries. These numbers are disheartening for fantasy owners, but on the bright side he was struggling with injuries throughout the year that could be considered the primary cause for his decline. Whatever the reason, fantasy owners are looking ahead and trying to decide whether or not Ellington will be worth an investment in 2015. In this article, we will look at the factors affecting his value in 2015 and try to figure out just where to draft this boom or bust candidate. Can Ellington be a lead back in today's NFL? The NFL today is a completely different animal than it once was. The days of a a single RB racking up 300+ carries on any given team are over, typically being replaced by RBBC's. The fact is that the league has evolved into a faster, pass-heavy style of play where individual backs serve different purposes such as pass catching, pass blocking, rushing between the tackles, and edge rushing. While this fact doesn't only have an effect on Ellington, it hurts him as much and possibly more than other backs because of his size. Measuring in at 5'9" and only 195 lbs, many believe that Ellington doesn't have the size and durability to be a lead back in today's NFL. Think Giovani Bernard minus 10 lbs. Like Bernard, don't be surprised if Arizona looks to add a bruiser at running back to take 1st and 2nd down carries, while spelling Ellington to 3rd down duties. Now, this isn't to say that Ellington can't be a lead back, but unless he can bulk up in the off season like the Cardinals want, expect another RB to enter Arizona leaving fantasy owners everywhere with another headache. Can Ellington stay healthy in 2015? In 2014 Ellington was plagued with a series of injuries that made it seem like he was made of glass. A week before the season started, Ellington tore a tendon in his left foot and then dealt with a hip flexor issue. Finally, Ellington's season was ended by a sports related hernia which required surgery that sidelined him for the remainder of 2014. Because Ellington has proven to be so injury prone, the need for Arizona to add not only a bigger, but also a more durable back is only more dire. Because of his injuries, Ellington was limited in his carries this season and failed to record a single 100 yard game. When looking at Ellington's current situation, we really find nothing but question marks. Can Ellington bulk up in the off season? Can he stay healthy in 2015? Will the Cardinals bring in another back to compliment Ellington? The questions go on and on. The only certainty entering 2015, is that the Cardinals will have improved run blocking in the form of elite run blocking guard, Mike Iupati. Unfortunately, even the addition of Iupati isn't enough to sell me on Ellington. Currently, Ellington is being drafted as an RB2 in most standard mocks due to the Cardinal's lack of depth at the RB position. However, the question marks surrounding Ellington are too much to ignore, and it's likely that the Cardinals will look to add a big back in either free agency (fingers crossed for Adrian Peterson) or the draft. Either way, any decent addition to the Cardinals backfield will only further hurt Ellington's value. I wouldn't reach for Ellington come draft day, but as a true boom or bust candidate I wouldn't mind taking him as my third or fourth RB. Nothing earlier. 2015 Poses Ideal Opportunity for... Eli Manning? Want to try your luck in daily fantasy leagues? Sign up for our free $1,000 fantasy golf contest, our free $15,000 MLB contest, or our PGA Master's Millionaire contest! Now, before you all go and gather your pitchforks, hear me out... I know that many fantasy owners have been burned by Eli in the past, and it's impossible to ignore the fact that just two seasons ago, Manning threw for just a mere 18 TDs and a pathetic 27 INTs and finished as the 21st QB overall. A lot of people like to hate on Manning because of these numbers but if you watch the film, a large chunk of those interceptions were on passes that bounced off of his receivers' hands. Additionally, Manning was stuck behind an abysmal offensive line and in the system of mediocre offensive coordinator, Kevin Gilbride. Manning turned those numbers around in 2014, throwing for over 4400 yards, 30 TDs and a respectable 14 INTs, finishing as the #10 QB in standard scoring. What's even more impressive than his turnaround was his ability to post these numbers in the first year of a completely different offensive system that was orchestrated by ex-Packers QB coach Ben McAdoo. Going into 2015, Manning has more potential than ever to be a top Fantasy QB. Why, you ask? Let's take a look. When Ben McAdoo became the Giants offensive coordinator last year, fans were ecstatic that they were finally free from the Kevin "Shotgun Draw on 3rd and 20" Gilbride system. Hopes were high that Eli would immediately become a stud. However, as any quarterback can tell you, learning a new offensive system always involves a learning curve. Always. For Manning, it took the entire preseason and the first three weeks of the regular season until he finally began to adjust to the new system, throwing for 300 yards and 4 TDs in Week 4, finishing with 32.1 points as the #1 QB that week. About half way through the season, Manning looked like he finally had acclimated to McAdoo's offense. A lot of people wonder why it took him so long. I mean he was just learning a new playbook, right? Wrong. From changing his drop back, to his reads and his release, Manning completely changed the way he played the quarterback position. With an entire season and another off-season of experience under his belt, Eli's knowledge and execution of the Giants' new offensive system will only improve. When free agency rolled around a couple of weeks ago, many analysts and Giants fans had figured that due to their offensive line troubles, the G-Men would target at least one of the top offensive linemen available in Mike Iupati, Orlando Franklin or Bryan Beluga. Nope. Instead, the Giants picked up former Bengal, Marshall Newhouse (an average offensive lineman at best). Additionally, the Giants went outside the box to improve ther line situation by turning to our neighbors to the north. This off-season, the Giants picked up the Canadian Football League's best offensive lineman in Brett Jones. Jones, 23, was voted the CFL's top rookie in 2013 and will add some much needed depth to the Giants offensive line. Aside from free agency, we cannot forget about this year's NFL draft. Many NFL analysts believe the Giants will take an offensive lineman (Brandon Scherff or Andrus Peat) with the ninth pick of the draft. Regardless of whether they decide to take a lineman in the first round or not, it is an absolute certainty that the Giants will look to bolster their pass protection at some point in the draft, and it will most likely be earlier rather than later. Finally, with Geoff Schwartz returning from injured reserve (along with 19 other Giants), Eli Manning will undoubtedly have more time in the pocket next year. Last year Manning had one of the most productive seasons of his career, completing 63.1% of his passes (highest completion percentage of his career) for 4410 yards, 30 TDs and only 15 INTs. What makes these stats even more impressive is that Eli was able to accomplish these numbers in a new offensive system, missing his favorite receiver in Victor Cruz since week 6. Before being injured, Cruz was on pace for another 1000+ yard season. Fortunately, the loss set the stage for rookie receiver Odell Beckham Jr. to have a record breaking rookie season, solidifying him as one of the most elite receivers in the NFL. Eli will look forward to having Cruz, his favorite receiver, back in 2015 and if all goes according to plan, he will return 100% healthy. However, things rarely go according to plan after such a major injury (torn patellar tendon). The top concern entering 2015 is that Cruz won't be able to regain his elite speed and route running ability. However, a sigh of relief may be in store for the Giants entering the draft. Recently, more and more buzz has been revolving around the idea that if Amari Cooper falls to the Giants in the draft, he may become the newest member of Big Blue. Now, while many people argue that the Giants don't need to take a receiver in the first round, GM Jerry Reese is notoriously known for picking the best available player on the board, regardless of team need. Either way, expect the Giants to have a better wide receiver corps in 2015. Additionally, the Giants gave Eli another weapon through free agency in the form of pass-catching specialist running back, Shane Vereen. In 2014, Manning completed 379 passes on 601 attempts (63.1%). Of his 379 completions, only 62 (16.5%) were caught by running backs. Enter Shane Vereen. In 2014, Vereen hauled in 52 passes from former teammate Tom Brady for 447 yards and 3 TDs. The year before, he caught 47 passes for 427 yards and 3 TDs. Without a doubt, Vereen has solidified himself as one of the most reliable pass catching backs in the NFL. In fact, last year only a handful of RBs had more receptions than Vereen, most of them being workhorse backs (Matt Forte, Le'veon Bell, Demarco Murray, and Fred Jackson). Expect Vereen's numbers to increase even further in 2015 under McAdoo's quick pass system, becoming Manning's number one check down option. Additionally with TE Larry Donnell proving that he is an unrefined but talented pass catcher and WR Rueben Randle finally showing flashes of greatness at the end of the season, it is easy to say that the Giants will have one of the most dangerous receiving corps in the NFL. Coming off one of the best seasons of his career (1st in completion percentage, 2nd in yards, 2nd in TDs, and 2nd in INTs), in a brand new system, missing his favorite receiver, Manning's fantasy potential has never been higher than it is entering 2015. A bolstered offensive line, the return of all-pro wideout Victor Cruz, and the addition of Shane Vereen means that the Giants look to be a pass first team next year under McAdoo's quick pass offense. Add all of those with the fact that Manning will finally have a full season of experience in McAdoo's system and you're left with a top 5 QB. What makes Eli even more enticing for 2015 is the fact that his name is Eli "27 Interceptions" Manning. This means that Manning will outlast most other QB1s in the draft, further increasing his value. Like the pic? Check out AJ Guel's flickr page for more! Do you love college basketball? Test your skills with the FREE March Madness beginner's contest! When news of Pierre Thomas' release from the New Orleans Saints broke earlier this month, Mark Ingram's stock skyrocketed. Prospective fantasy owners were beaming at the idea that Ingram may finally become the workhorse back that we've all wanted him to be. However, all of that changed in the past week when the Saints signed veteran running back C.J. Spiller to a hefty 4-year, $18 million contract. While the Saints are clearly going to benefit from signing Spiller, fantasy owners are at a loss and it's tough to get a good read on the situation. Will Spiller be relegated to "change of pace" duties, or are we going to see another true timeshare in New Orleans? In this article we will break down the strengths and weaknesses of both players and try to make sense of this headache of a backfield. Although the Saints most likely plan on using these two great running backs in tandem, the simple truth is that both of them perform better when the spotlight is solely on them. Last year when Mark Ingram was finally given the reins, he posted a modest, yet respectable 4.3 yards per carry average. Though not eye-popping, his 9 TD's in 13 games shows that he has what it takes to produce as a starting fantasy RB. Likewise, during C.J. Spiller's breakout 2012 campaign, he averaged an incredible 6.0 yards per carry along with 8 total TD's. Although his numbers have been less than stellar since 2012, Spiller has undoubtedly proven that he has what it takes to be a viable starting fantasy RB. Additionally, both of these young veterans have been cursed by playing behind fan-loved veterans in Pierre Thomas and Fred Jackson. Now that both are free of that burden, the numbers will decide who gets the spotlight next year. When looking at the numbers, both Ingram and Spiller have proven to be quality running backs, each averaging 4.2 and 5.0 yards per carry throughout their careers, respectively. 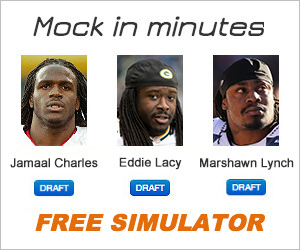 However, in today's NFL an RB must be multi-dimensional. The days of 25+ carries per game are over. Today, it's about making the most of what little opportunities you have, and more importantly, being a threat in the passing game. This fact becomes even more important when talking about the Saints offense, as they attempted to pass on 61.8% of all offensive plays in 2014. So what does this mean for Spiller and Ingram? The simple answer here is that Spiller dominates Ingram in the passing game. In five seasons Spiller accumulated 158 receptions for 1,195 yards and 6 TD's. Likewise, in four seasons Ingram was only able to accumulate 53 receptions for 288 yards and 0 TD's. Although Ingram was playing with Pierre Thomas, a receiving back specialist, it is clear that Spiller will be the receiving back in New Orleans' offense, further boosting his stock in PPR formats. So far we've come to two simple conclusions. First, both Spiller and Ingram are capable of handling starting RB responsibilities and thrive in a workhorse back setting. Second, C.J. Spiller has proven to be the superior pass catching RB, a trait necessary to thrive in the Saints offense. Unfortunately these two facts lead to the likely conclusion that Ingram will handle 1st and 2nd down duties, while Spiller will come in on 3rd down and other passing situations. Unfortunately this means the worst for fantasy owners as neither Spiller nor Ingram will reach their true fantasy potential in 2015. However, there is a bright side. As both running backs have proven to be quality starters, and both have a seemingly unfortunate injury history, this combination should be looked at as one of the most valuable handcuffs going into 2015. If either Spiller or Ingram go down at some point in the season, expect the other to thrive as the sole rusher in the Saints backfield. Additionally, because Spiller is the more proven back, him taking over starting RB duties is not outside the realm of possibility. At the end of the day, against most mocks to date, I would take Spiller before Ingram come draft day (especially in PPR formats). Either way, if you decide to take either of these RBs in 2015, you had better make sure to grab the other while you can. Tired of getting beat by the pros in Daily Fantasy leagues? Try this beginners contest with over $1 million in prizes. Throughout the 2014 season, one of the biggest stories was the immediate success of the rookie wide receiver class. Whether it was Odell Beckham’s “catch seen around the world,” or Mike Evans consistent production week in and week out, the fantasy world was buzzing over the unprecedented success of the rookie class. And it wasn’t just Beckham or Evans making headlines. In fact, for the first time ever, eight rookie wide receivers finished within the top 50 WRs on the season (almost 20%!). But can we expect this production again? It is well known that the dreaded ‘sophomore slump’ has claimed many an NFL rising star (Michael Clayton, Mike Williams, and Zac Stacy to name a few). So what does this mean for the best WR class to date? Can we expect eye-popping numbers again, or are we doomed to fantasy peril by investing in these young stars? In this article we will examine the top rookie WRs from last season and predict whether they will rise or fall in their sophomore season. The man, the myth, the legend. The 2014 offensive rookie of the year had the greatest start to his career than any other wide receiver in history. Period. In only twelve games he caught 91 passes for 1,305 yards and 12 TDs. Wow! But what can we expect from the breakout rookie in 2015? It should come as no surprise that Beckham’s production was increased after the season ending injury suffered by wide out Victor Cruz. With Victor Cruz coming back next season we shouldn’t be surprised if Beckham’s targets drop a bit. However, his production may not take too much of a hit (if any at all). With Cruz back on the field defenses will have one more playmaker to keep their eyes on. And with the emergence of Rueben Randle towards the end of the season (further catching the attention of opposing defenses), OBJ will have plenty of space to work with. Additionally, with Eli Manning growing more and more accustomed to Ben McAdoo’s new offense, we should have a top 5 wide out on our hands. Entering the offseason, the Tampa Bay Buccaneers have many holes to fill, the most important of these being at the QB position. With the #1 pick in the 2015 draft, the Bucs are expected to take one of the top two QBs of the draft in Jameis Winston and Marcus Mariota. Rookie QBs are always a big question mark going into a season, but if Mike Evans was able to produce top 10 numbers with Josh McCown and Mike Glennon under center, we shouldn’t expect less with either of the two rookie QBs. As a true deep threat, Mike Evans should pair nicely with the strong arm of Jameis Winston, giving us a possible WR1 next season. In his rookie season, Kelvin Benjamin utilized his size, becoming one of the greatest red zone threats in the NFL. Unfortunately for Benjamin, he’s the only receiving threat on the field, and with a less than mediocre run game, defenses need only focus on Benjamin. Additionally, the Panthers must upgrade their offensive line in order to give Benjamin time to create space and allow Cam Newton to find the open man. With the recent release of veteran RB DeAngelo Williams, the Panthers need to add some playmakers to their roster if Benjamin has any chance of repeating his solid WR2 numbers in 2015. Matthews is that Chip Kelly really likes him. In fact, he had to trade up in the draft (10th pick of the 2nd round) just to get him. With the approval of Chip Kelly, Matthews saw plenty of playing time right off the bat. However, his production fell in the middle of the season (failed to gain more than 50 receiving yards in a game between weeks 4-10). This was not Matthews fault. The fact of the matter is that the Eagles need to address their quarterback situation, and if we know anything about Chip Kelly, he’s not a afraid to make a monumental deal that would give Matthews the help that he needs. At the beginning of the season, it appeared as though Sammy Watkins deserved to be the first receiver taken in the 2014 draft. However, as the season progressed Watkins’ numbers were devastated by poor QB play in Buffalo. Unless the Bills can trade up in the draft and grab Winston or Mariota (probably not going to happen), it is unlikely that the Bills QB situation will improve in 2015. A natural talent, Watkins is plagued by a poor offense and poor system. Additionally, Watkins doesn’t have the speed (4.43-40) of fellow rookie Brandin Cooks (4.33-40), or the size (6’1” 205 lbs) of fellow rookie Kelvin Benjamin (6’5” 243 lbs), or the hands of fellow rookie Odell Beckham Jr. Though it is undeniable that Watkins is a natural talent, all of these factors lead us to believe that we may see a true sophomore slump from Watkins next season. Editor’s note: This is part three of an eight-part series where we will look at each team’s receiving core by division and analyze which receiver will be the favorite for most targets. As fantasy owners know, targets are a crucial part of success for fantasy receivers. This week covers the NFC South. While success during the preseason does not guarantee fantasy success, there were a few players who made positive first impressions. While most of the starters will not play more than a series or two in the opening week, that does not mean fantasy football owners will not take note on how prospective players are perform. Here are four players who are on the rise after their first preseason game. We believe Fantasy Football success comes down to two things — opportunity and talent. You will have Fantasy Football mastered once you understand how good a player is and how good of an opportunity he has to gain yards and score touchdowns. The thing is, you'll never master Fantasy Football. But you can get pretty darn good at it when you have even a slightly better understanding of opportunity and talent than the average Joe. That's what Fantasy Football Helpers is dedicated to doing.